Last and definitely NOT the least, where all the magic happens – SimpleSSISDeploy.ps1. throw New-Object System.ArgumentException "Parameters.xml not found"
throw New-Object System.ArgumentException "Could not connect to Server: $serverName. Does it really exist?" 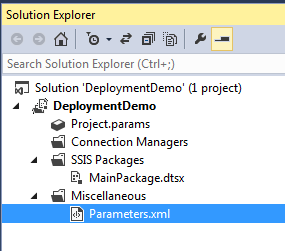 $catalogConnectionString = "Data Source=" + $serverName + ";Initial Catalog=master;Integrated Security=SSPI;"
throw New-Object System.ArgumentException "Check that $Environment build configuration is set correctly in the SSIS project." Write-Host "Unable to connect to Integration Services Catalog." Write-Host "Could not find "$catalogName" Catalog. Are you sure you have the correct name?" Write-Host "$folderName catalog folder found"
Write-Host "Could not find $folderName catalog folder. You are almost there." Write-Host "$projectName project not found. Sorry :("
Write-Host "$parameter project parameter found"
Write-Host "$parameter project parameter value updated"
Write-Host "$parameter project parameter NOT FOUND"
Write-Host "Updating parameters of" $project.Name "project successful"
Write-Host "$paramName package parameter found"
Write-Host "$paramName package parameter value updated"
Write-Host "$paramName package parameter NOT FOUND"
Write-Host "Updating parameters of $packageName package successful"
Write-Host "$packageName package NOT FOUND"
.\SimpleSSISDeploy.ps1 -ConfigurationsPath "F:\PROJECTS\SSISProject\DeploymentDemo\DeploymentDemo\DeploymentDemo.dtproj.user" -IspacPath "F:\PROJECTS\SSISProject\DeploymentDemo\DeploymentDemo\bin\Development\DeploymentDemo.ispac" -ParametersXml "F:\PROJECTS\SSISProject\DeploymentDemo\DeploymentDemo\Parameters.xml" -Environment "Development"